Kathleen O'Toole, who has served as Seattle chief of police since 2014 and has overseen extensive reforms in that time, called her decision to leave "more personal than professional." 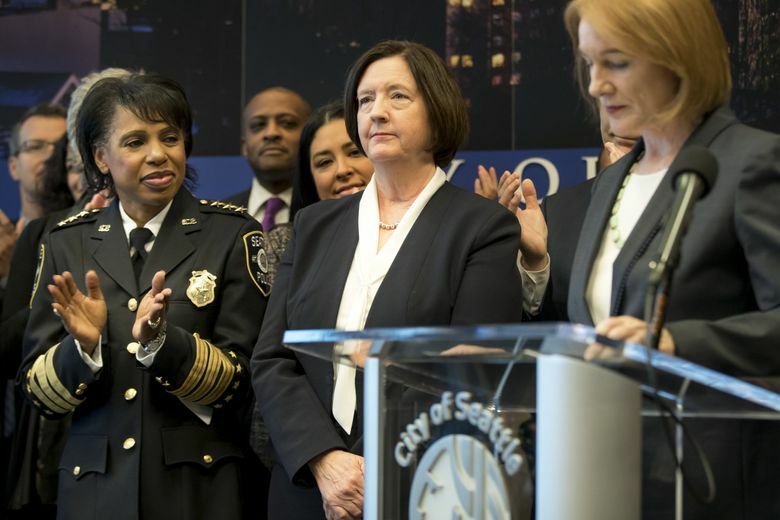 Mayor Jenny Durkan’s search for a new Seattle police chief will be keenly watched throughout the city, but one of the closest observers will be the federal judge set to decide whether the Police Department is in compliance with court-ordered reforms. The announcement on Monday that Kathleen O’Toole is departing at the end of the year served as a reminder of the important role of the chief: It was O’Toole who in June 2014 took over the department and turned it around as it was still struggling to comply with a federal consent decree, signed in 2012, requiring it to remedy a history of excessive force and biased policing. After a series of positive report cards, the city is currently awaiting a ruling by U.S. District Judge James Robart on whether to grant its request to find it in full and effective compliance with the consent decree. If Robart does that, the next step likely would be a two-year period in which the Police Department would have to show the reforms are locked in place, or face further scrutiny. Her decision to leave ended months of speculation on her future, amid a tumultuous time in city government. Deputy Chief Carmen Best, who joined the department in 1992, will serve as interim chief beginning Jan. 1, Durkan said during the news conference. Durkan and O’Toole expressed high regard for each other, with O’Toole saying she agonized over whether to remain with a mayor who wanted to retain her. But O’Toole has been mulling her future since May, when former Mayor Ed Murray, who selected her in 2014, announced he wouldn’t seek re-election because of allegations he sexually abused teens decades ago. O’Toole’s husband, Dan, also was rebounding from serious health problems. She nearly resigned then, but decided to stay at the urging of others to help usher the city through a difficult period. Her departure is consistent with her professional life. O’Toole has spent much of her career as what she calls a “change agent,” working with police agencies in the U.S. and Ireland to carry out reforms, rather than as a long-term leader. O’Toole served as Boston’s first female police commissioner from 2004 to 2006. Durkan’s victory in the Nov. 7 mayoral election made it easier for O’Toole to cement her plans. It was Durkan, in her previous role as U.S. Attorney in Western Washington, who, along with the U.S. Justice Department, oversaw the investigation of the Seattle Police Department that led to the consent decree. Durkan, who outlined a search process in which she will solicit community views, said she hopes to have a new permanent police chief in place by spring. “Even though we have made great progress, there is still much to be done,” Durkan said of police reform. Best answered “absolutely” when asked by a reporter whether she planned to seek the permanent job. But Durkan and Best could come under pressure as to whether Best should be allowed to serve as interim chief and apply for the job instead of choosing between the two. Allowing Best to apply might drive away top national candidates who conclude the interim chief has an inside track. Best’s decisions as interim chief also would be seen through the constant prism of how they affect her chances to be selected. During O’Toole’s 3½-year tenure, she oversaw a makeover of the command staff, the implementation of body cameras and the prompt release of more information after fatal shootings by officers. She also met tirelessly with community groups. O’Toole suffered a setback in 2016, when a King County Superior Court jury found she had retaliated against a veteran sergeant who complained that lucrative overtime pay had been improperly steered to four favored black officers. The jury awarded $1.9 million to the sergeant, who is white, and a $932,000 to a captain who opposed the department’s plan to transfer her to another precinct. O’Toole testified she transferred the two to defuse a “powder keg” between warring officers. The city is appealing the verdict. The department has also been sharply criticized over the deadly June shooting of Charleena Lyles, a 30-year-old African-American mother of four, by two Seattle officers after she reported a burglary and, according to the officers, suddenly attacked them with one or two knives. Lyles’ family members have said they believe race was a factor. The officers who shot her are white. The department’s Force Review Board has found the fatal shooting to have been reasonable, proportional and within policy. O’Toole will continue working as the part-time chair of the Commission on the Future of Policing in Ireland, a post to which she was nominated in May to help bring about reforms in response to controversies involving that nation’s police force. She previously served as chief inspector of Garda Siochana Inspectorate, an agency that monitors the operations and administration of Ireland’s national police force, from 2006 to 2012. O’Toole also is expected to participate in reforms efforts involving the Chicago Police Department and possibly the Baltimore Police Department. U.S. Attorney Annette L. Hayes in Seattle described O’Toole as a “true partner” in advancing police reform and public safety in Seattle and, by her example, around the country. “I am grateful for her professionalism, wisdom, and friendship,” Hayes said in a statement. Under O’Toole’s leadership, Hayes said, the department transformed how it served the city by carrying out new policies, training and accountability on use of force, crisis intervention and biased policing. Also among those praising O’Toole was Seattle City Councilmember Sally Bagshaw. In choosing a new police chief, the city must always weigh the advantages of an outsider’s perspective against the value of local experience, Bagshaw said. Councilmember Kshama Sawant, the Socialist Alternative Party leader who cast the lone vote against confirming O’Toole in 2014, criticized the chief’s tenure Monday. The council member said she expects activists, including those in the Black Lives Matter movement, to put pressure the next chief for more radical reforms. The Seattle Police Officers’ Guild, the union that represents more than 1,300 sworn officers and sergeants, issued a statement Monday thanking O’Toole for her leadership. The guild also congratulated Best on her pending appointment as interim chief. “Chief Best has come up through the ranks and SPOG has full confidence in her ability to lead the department and to continue the work that was done by Chief O’Toole,” the statement said. In addition to the police-chief announcement, Durkan announced that Barb Graff, director of Emergency Management, and Harold Scoggins, chief of the Seattle Fire Department, will remain in their positions. Tim Burgess — A longtime civic activist and former Seattle police officer, Burgess served on the Seattle City Council from 2008 to 2017, including a stint as chair of the council’s public-safety committee. He played a key role in police reform and was a member of the 2014 search committee that helped select O’Toole as police chief. Most recently, he served as interim mayor after former Mayor Murray resigned. Colleen Echohawk — She is the executive director of the Chief Seattle Club, a nonprofit dedicated to meeting the needs of homeless and low-income urban Native people. Echohawk is the founder of the Coalition to End Urban Native Homelessness and serves on Seattle’s Community Police Commission. Sue Rahr — Rahr was elected King County Sheriff in 2005 and retired in 2012. In April 2012, she was appointed executive director of the Washington State Criminal Justice Training Commission, where she has overseen a cultural shift in training city and county police officers and corrections officers called “Moving from Warriors to Guardians.” Her work led to her appointment in 2014 by President Obama to his President’s Task Force on 21st Century Policing. Jeffrey Robinson — A nationally recognized trial attorney who practiced for many years in Seattle, Robinson is a deputy legal director and director of the American Civil Liberties Union’s Trone Center for Justice and Equality. He will serve on the search committee in a personal capacity. Among his cases, he has worked on behalf of one of five men held at Guantánamo Bay charged with carrying out the Sept. 11 terrorist attacks.